She balances delicately, one foot not quite touching the ground, ready for takeoff. Mother-daughter alchemy has spun balloons, toilet paper rolls, plaster strips and the end of a Sonic cup into something altogether unworldy. Tomorrow, we shall paint her purple with silver sparkly wings. Thirteen is not easy. Not for you, not for me. Rough waters bubbling with independence and new worries and hormones, oh my Lord, the hormones. But perhaps, in the midst of everything, you will remember that this Saturday night, we giggled and told stories, and carefully wrapped plaster straps around balloons. And together, created something impossibly wonderful. I love the pig. I love the post. 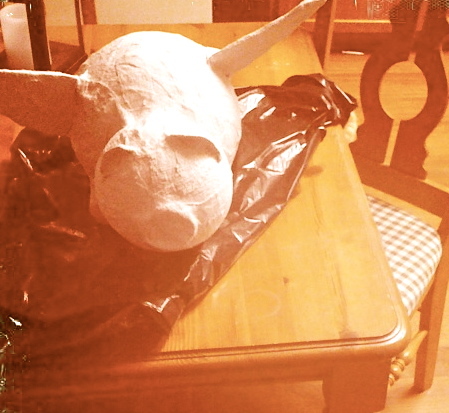 Please post the purple painted pig upon completion. This post warms my heart. I think the time, the projects, the shared moments will be remembered. Love to you! Done — finished flying pig now posted. =) Love right back to you! Super sweet! I wish there was some craft I could do to make me remember I love the cat even when he makes me want to open the door and tell him to take it outside for good (you can’t do that with real kids, so I imagine I shouldn’t do it with him). Hmm, kitty crafts. Let me see what I can come up with.